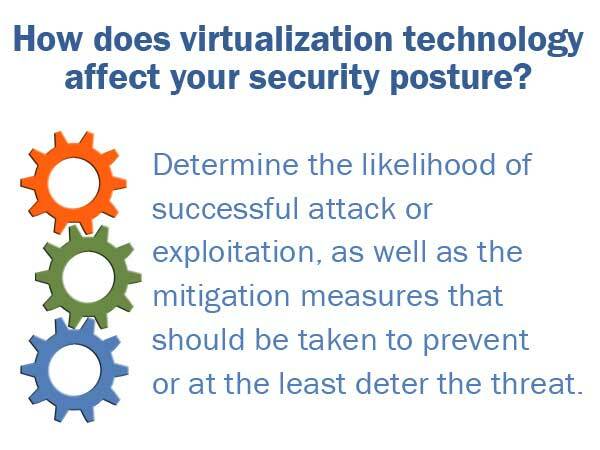 InfoSight's Virtualization Security Assessment will help you understand the security posture of your virtualized infrastructure, and establish optimal plans that achieve policy or compliance objectives, without compromising the value of your virtualization technology. A virtualization security assessment is an explicit study to identify IT security vulnerabilities and risks in a virtualized environment. The assessment process includes the evaluation of policy and technical characteristics of the infrastructure. To determine your overall risk posture, we assess all critical components of the virtual infrastructure, as well as any physical systems and network devices connected to it, including the security of server platforms, virtual host types, virtual and real network configurations, management systems, access controls and relevant operational and security controls. Once the virtualization security assessment is completed, we make recommendations on how to reduce your infrastructure vulnerabilities and mitigate risks, and provide guidance on how to incorporate virtualization security into your compliance planning. InfoSight's security experts possess considerable expertise in designing and reviewing virtual environments, and can provide in-depth analysis of the risks facing your organization's virtualization infrastructure.